I’ve been so busy over the past couple of weeks that I’ve not had time to mention our good news from the beautiful south. 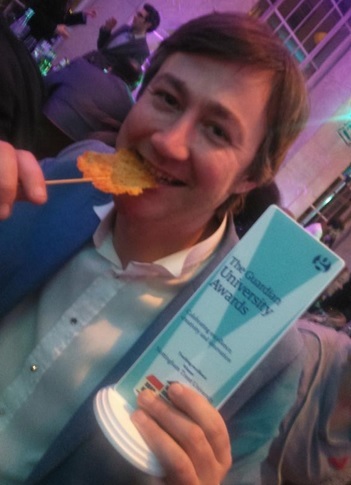 On March 18 the Guardian made it official that we’re mint when we scooped the Teaching Excellence Award through our partnership with Nottingham Trent University. The event was held at RIBA on Portland Street which of course enabled me to make my first link with Nottingham thanks to William John Cavendish Cavendish-Scott-Bentinck, the eccentric subterranean Duke who featured in Issue 8. Earlier in the day I made two other Nottingham connections when I made a pilgrimage to Byron Villas in NW5, the former residence of DH Lawrence. (Thanks Secret Artist). Beardo lived here in 1915 when The Rainbow was declared obscene by London magistrates, but this was nothing to the uproar a certain book would cause in 1928 which would have to wait until Penguin’s victory in the Lady Chatterley Trial of 1960 before the public got their paws on it. You can read about that in issue 7. My other visit was to the statue of Sherlock Holmes outside the Bakerloo tube station. 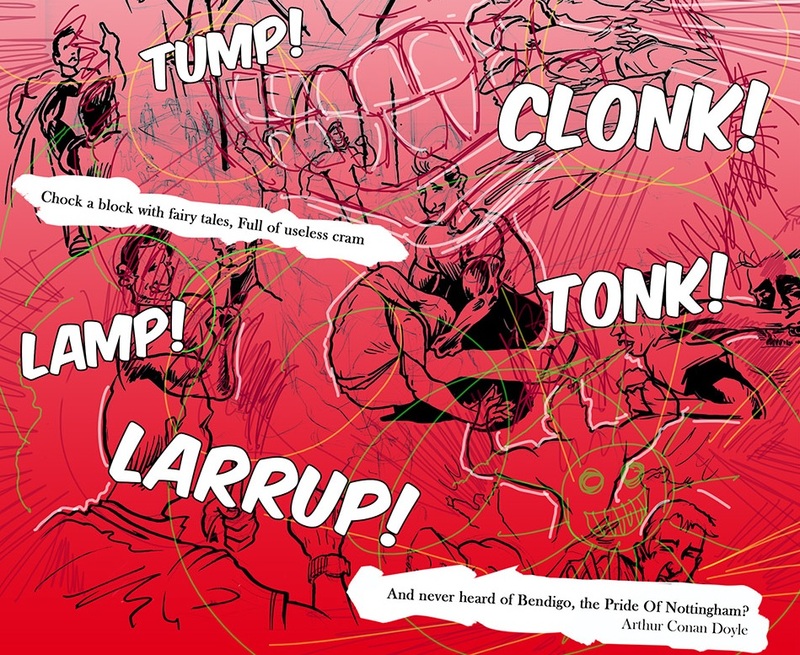 Sir Arthur Conan Doyle was of course responsible for the poem Bendigo’s Sermon, which is directly referred to in Al Needham’s street brawling adventure in issue 9. And come to think of it, my earlier visit to the British Library and the Magna Carta exhibition could be linked to our Gotham Fool issue where we touched on the unforgiving reign of King John. Thanks to this project I’ve turned into a Nottingham propaganda monster, able to find the most tenuous of links to my home town. Or perhaps this is an occupational hazard of editing: you are constantly looking for connections, patterns and meaning. Murray Pratt, the Dean of Arts and Humanities at Nottingham Trent University, has been an absolute lifesaver. He has created a two-day a week secondment for me to work on the project which has led to talks at the British Library, Game City and Durham University, where we’ve debated issues raised by the project that will hopefully keep the conversation going long after our final comic is published on 8 June. The award was mainly due to the way we were able to bring together all strands of the digital humanities and create placements for around 120 students as part of their Humanities at Work module. The numbers are still growing. They’ve been involved in every area of the project and I can’t imagine how we would have achieved our ambitious aims without them. But Dawn of the Unread has also been used to enhance the curriculum. The two videos in this blog were both produced as third year dissertation projects by Media students after I wrote ten briefs for them to choose from. The clock is on the stroke of six, The Father’s work is done; Sweep up the hearth and mend the fire, And put the kettle on. An English student is now considering a dissertation thesis on the lack of representation of women in book review sections. This conversation started after I asked her to read Mary Howitt’s two autobiographies in order to create a Twitter profile for us. She had never heard of the Victorian poet and was unaware that Howitt not only translated the works of Hans Christian Anderson but was also one of the first people to write dietary advice for the working classes in her Howitt’s Journal. This then led to a conversation about the #ReadWomen campaign and the problems of institutionalised gender bias and why it is so important that Nottingham has a Feminist Library at the Women’s Centre on Chaucer Street. This is just one of many examples of how we have been able to use our comic as an educational tool for both our target audience (reluctant readers/Youtube generation) and aspiring students.